Time Sawyer is interested in “real people and real songs” and that’s just what the listener finds in their music – a sense of realness. Time Sawyer blends a grassroots feel with heart-felt lyrics to put on an entertaining show. From introspective ballads to high-energy crowd-pleasers, Time Sawyer’s songs land in that rootsy sweet spot where folk, alt-country, and rock gather for a good time. The folk rock band’s name reflects the pull between the past and the future. The character Tom Sawyer evokes the rural background and love of home that lead vocalist/guitarist Sam Tayloe and vocalist/banjo player Houston Norris, share. Time is a muse for songwriting; it’s the thread that runs through life, bringing new experiences and giving us a sense of urgency, while still connecting us with our past. Time Sawyer has performed on the stages of some of the Southeast’s most iconic festivals, including Merlefest, Floydfest, Bristol Rhythm and Roots Reunion, Rhythm n’ Blooms, Carolina in the Fall and IBMA’s Bluegrass First Class. They’ve shared bills with Langhorne Slim, Phil Cook, Steep Canyon Rangers, The Wood Brothers, Joe Pug, Holy Ghost Tent Revival, and many more. 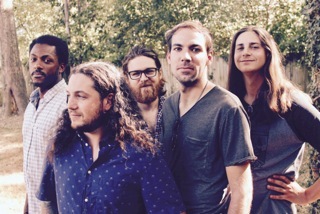 The band’s original members, including guitarist Kurt Layell and drummer Clay Stirewalt, along with Tayloe and Norris, started performing and recording together while they were all students at University of North Carolina at Charlotte. They went on to record five albums together, each demonstrating growth, with more skillful instrumentation and more sophisticated arrangement, all while retaining the honesty and directness that has been a hallmark of their music from the start. Time Sawyer now operates as a 5-piece comprised of some of North Carolina's best musicians, while also giving Tayloe & Norris the flexibility to strip it back for acoustic duo & trio performances when desired. The memorable lyrics and strong melodies result in songs that will stay in your head long after the music stops. Time Sawyer continues to develop a loyal and growing fan base. Whether they’re playing in an intimate listening room or a large outdoor festival, their goal is to forge a face-to-face connection with the audience so that they become friends who happen to be fans.